Let me start by apologizing for the absence of posts for a while. My ‘day job’ of running our asset management shop has taken precedence in this turbulent times, along with my hobby project TradersPlace.net. Next week, on Wednesday the 26th of June, I’ll be in London speaking at the Battle of the Quants. Hope to see you there. Ok, let’s have a look at what the CTA business has done lately. Things have been a little turbulent lately for many funds. The industry got a bit of a bad press on FT recently as well. Many funds took a bit hit in May. Let me explain why. The problem can be summarized in one word; Rates. The May debacle for many large funds is not terribly surprising. This whole rates situation has been a worry of mine for some time and it’s far from over. For those who read Active Trader Magazine, I just wrote an article a month ago for them about this very problem. An overwhelming part of CTA returns the past decades comes from rates. Both from the so called risk free money earned on excess capital and on simply rolling long bond futures year after year. 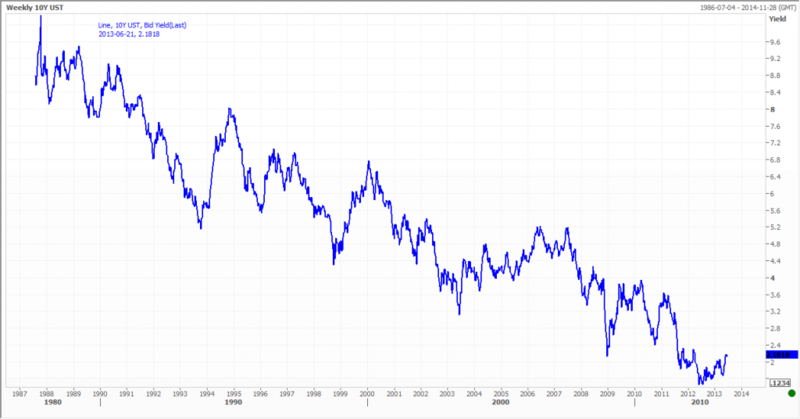 As yields in the Western world have slowly gone down for several decades, bond prices have steadily risen. Now we find ourselves in a situation where yields are approaching zero. The problem is that traditional trend following models are not built for a near zero yield environment. They are completely unaware that yields are mathematically bound by zero. If the models are not adapted for this new situation, they will tell you to enter highly asymmetrical risk situations. 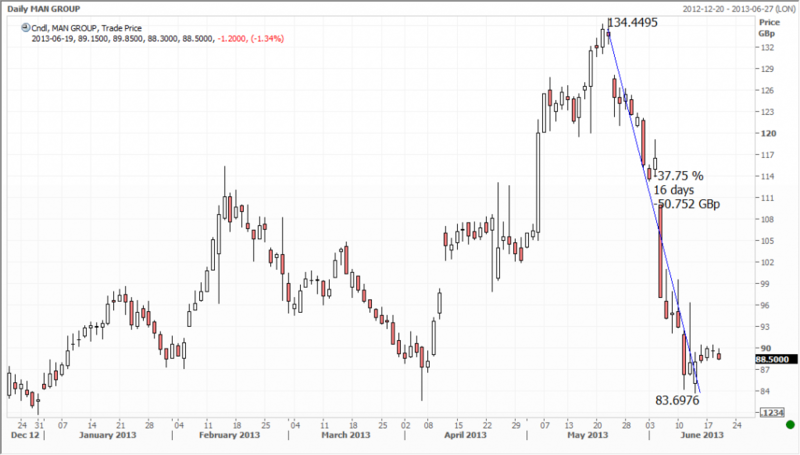 Bond futures are in a long term upwards trend. So on every new high, you’ll be told to buy open if you’re not already in it. Now, if you go long on new highs in bond prices, you face a very unfair situation. Major moves up are not mathematically possible. But major moves down are not only possible but highly probable. 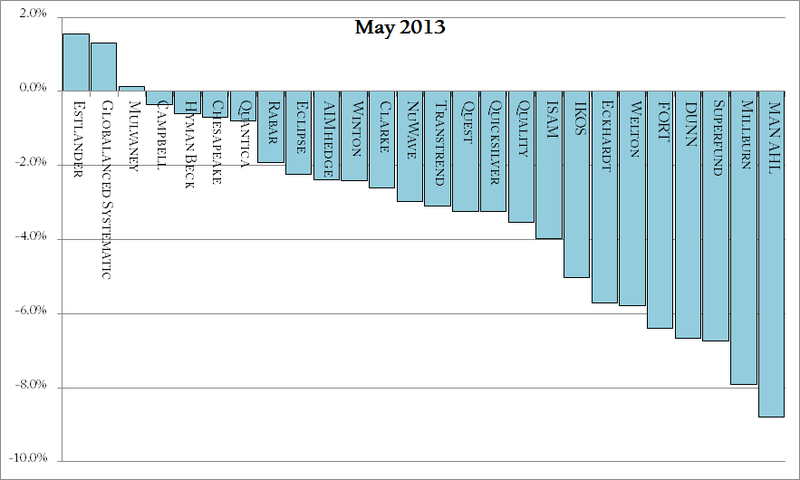 This is what happened to many CTA funds in May. They were all massively long bonds and then a larger pullback came along. So why are these funds not adapting? Why don’t they stop taking long bond bets or at least start taking much smaller sizes? Because most of them have no choice. If you find yourself managing 10 billion dollars in a managed futures strategy, your hands are pretty much tied. Where could you possibly move such massive amounts? There are only two super liquid sectors. 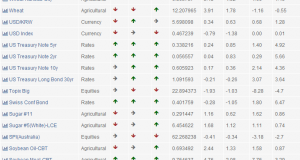 Foreign exchange and fixed income. Forget about agriculture. There is no way you can move enough to matter in those markets if you’re a big shop. Metals? You can do a little, but not enough. Energies? Same. Equities? No way, and besides, that’s the most difficult sector to make money from with these strategies anyhow. So they’re stuck with having to put most of their money in these two sectors. Now the AHL MAN performance is especially interesting. This is something as oxymoronic (yes, I’m well aware of that word’s absence from the Oxford dictionary) as publicly traded hedge fund management company. Call me old fashioned, but I miss the times when the hedge fund industry was about a manager putting all his own cash to work and letting others in for the ride. Once you go all corporate, accountability and long term view goes right out the window. As for all industries of course, not just finance. Once there is no owner/manager left, things change fast. Look at what happened to their own stock when the NAV of their main funds started going south. Investors realized that performance fees might not be so likely this year either. Now imagine what kind of pressure management is under. And they are now corporate. They can’t take the long term view, as a manager/owner could. In the interest of the company or not, they need to act fast not to get fired. So what about the Core Strategy from Following the Trend? It is also completely naive to the risks of asymmetric bond futures risk. It’s not very difficult to adapt the strategy to this new condition. But doing that for these posts would be cheating, wouldn’t it? For real trading, I’d recommend that you up take this into account, as I have for real trading, but for these posts I’ll keep reporting the strategy as outlined in my book. 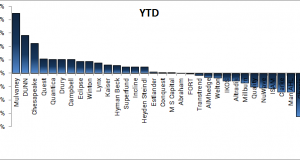 The equity chart this year may look boring, but it was actually quite eventful. We had almost ten percent gains in January, lost it all, made it back and lost it again. As it stands, the strategy is up one single percent on the year. Still, the volatility has been less than for most competitors and as opposed to most of them, we still hold a gain. So what gives? Are we done with the difficult period for CTAs yet? Impossible to say for sure. We’ve just had the longest and deepest drawdown period in the history of CTA funds. In my view, all signs point to that this is starting to turn up. The minefield being the bonds which could be bypassed. I’d say we’re seeing a similar situation in managed futures as equities had in 2009. No one wants to talk about it. No one wants to invest in it. But it will turn out to be the buying opportunity of a decade.